If no charge there is, then download you must. Yoda was always a pretty small guy, so LEGO Yoda is downright tiny. How tiny, you ask? Tiny enough to fit in your phone, apparently, because LEGO is putting together a mobile game starring everyone's favorite diminutive Jedi. 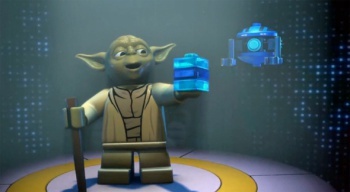 LEGO Star Wars: The Yoda Chronicles, based on the web series of the same name, is coming to iOS devices for free on May the Fourth (be with you), because you should never settle for a boring release date when your release date could also be a pun. The Yoda Chronicles will see Yoda fight through 15 levels and five bonus missions of dungeon-crawling, lightsaber duels, and space combat alongside a group of young Jedi padawans. Count Dooku serves as the game's antagonist, but you can also cross over to the Dark Side and use him as a playable character, though we all know who will get more time in the lime light - the game isn't called The Count Dooku Chronicles, after all. It appears the game will feature some RTS elements as well, in a departure from previous LEGO Star Wars games. Collectable studs will allow players to build troops, tanks, and starships, which can be commanded using a minimal interface. Strong performance in the bonus missions will boost the strength of your troops in the main campaign, adding another layer of meta-strategy. Yoda is a general in the Clone Wars, so it makes sense to tap into larger-scale tactics in addition to his personal adventures. Only half of the game's levels will be available at launch, with the rest being added over the summer. The game will initially be available on iOS and LEGO's official website, all free of charge, with an Android port coming later in the summer. If you have a LEGO ID, you can transfer your saves between the mobile and web versions of the game. Sounds like it'll be very portable and very free, meaning there's little standing between you and action-packed adventures with the best green-skinned Jedi in the galaxy. Well, second-best: I'm still holding out for Kit Fisto to get his own game.